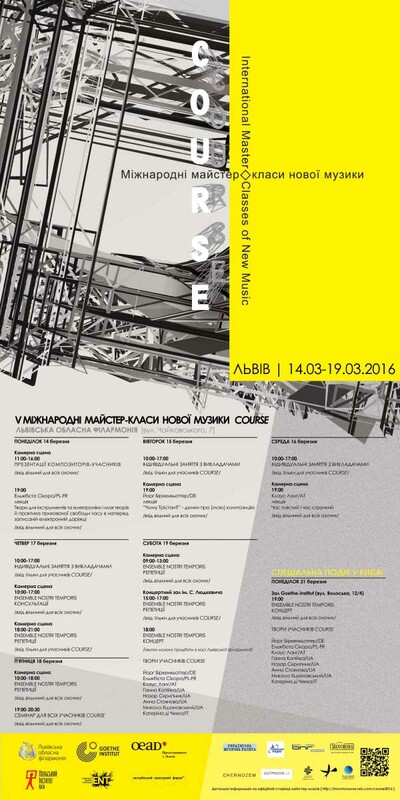 From 14th through 19th of March 2016 in Lviv will take place the Fifth International Master Classes of New Music COURSE. 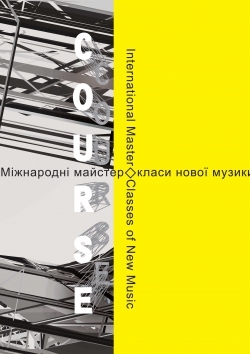 COURSE are the first annual international master classes for young composers in Ukraine, dedicated to stimulating creative activity within the community of Ukrainian musicians as well as to help young composers establish new creative contacts with their colleagues from other countries. 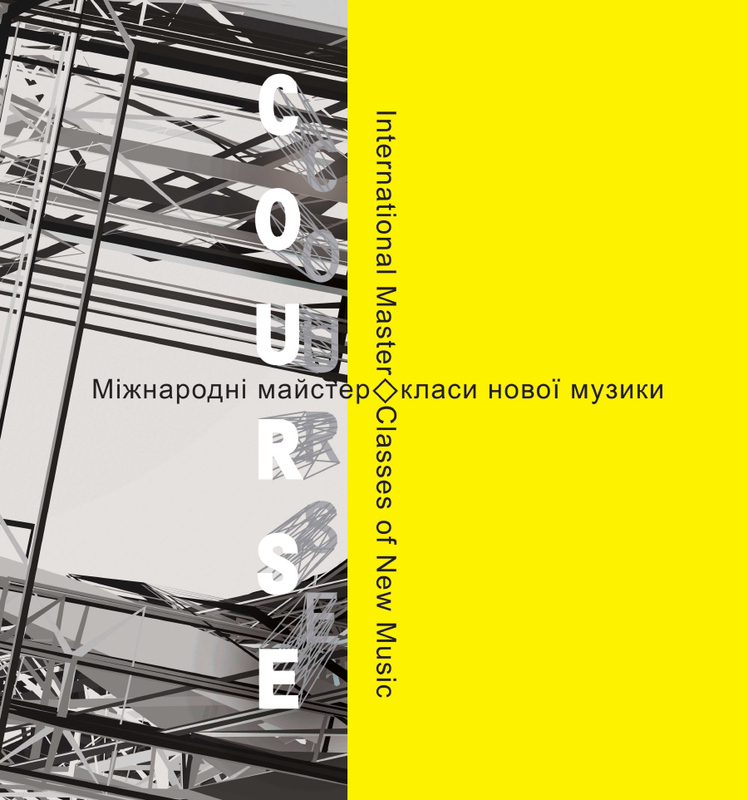 Founded in 2012, COURSE have become one of the leading master classes of new music in Eastern Europe. During the first four years of COURSE's existence, 33 young composers from Germany, Latvia, Greece, South Korea, Russia, Kazakhstan and Ukraine participated in the master classes, as well as two young Ukrainian musicologists. Ten composers from Germany, Austria, Poland, Czech Republic, Russia and Ukraine taught at COURSE. This year COURSE is taking place for the fifth time in Ukraine and for the first time in Lviv. Five young composers from Ukraine (Hanna Kopiika, Nazar Skrypnyk, Anna Stoyanova, Mykola Khshanovskyi and Bohdana Chepeliuk) and one composer from Italy (Caterina Di Cecca) will be attending classes by three renowned composers from Europe who were invited to Lviv to teach at COURSE: Elżbieta Sikora (Poland/France), Jörg Birkenkötter (Germany) and Klaus Lang (Austria). Events of several different formats will allow young composers to present their work as well as to gain unique experience of intellectual exchange with the invited teachers and consultations with the musicians of Ensemble Nostri Temporis. At the end of the master classes the participants will be able to hear the premieres of their works performed by Ensemble Nostri Temporis on March 19th in S. Lyudkevych Concert Hall (Lviv Philharmonic Society) and on March 21st in Goethe-Institut Hall (Kyiv). Additionally, the best participant will be commissioned by the organizers to compose a work for ensemble to be performed on the XXII Contrasts International Contemporary Music Festival which will take place in Autumn this year in Lviv. The master classes will take place in Lviv Philharmonic Society. Along with individual classes with teachers, that will be only accessible to the participants of the master classes, there will be several events open to anyone.